This week, Samsung announced the first 1 TB embedded Universal Flash Storage for smartphones, with mass production already underway. This means that portable devices will soon be able to pack 1 TB of storage into a single flash memory chip. The new component will allow smartphone users to enjoy the same storage capacity levels as premium notebooks without the need for additional memory cards. Samsung's Galaxy Note9 handset, launched in August 2018, is available in a 512GB build, with support for a removable microSD card adding up to 512GB, meaning that it does have the potential to be a 1 TB phone. Apple's latest iPhones offer a 512GB option but no expandable memory. It seems bigger memory configurations are the path that leading smartphone makers continue to follow. Samsung's flash storage is based on its advanced V-NAND flash memory technology, which has enhanced density, lower power requirements and generally faster speeds. It makes use of vertical stacking of single NAND cells which, compared with the horizontal layered arrangement of regular NAND, is much more efficient. The new storage chip is fast, with speeds of up to 1,000 Mbps — 10 times faster than a standard microSD card. It's also relatively small, measuring 11.5 mm x 13.0 mm, the same size as its older 512GB sibling. Samsung says the random speeds allow for fast continuous shooting at 960 frames per second and will enable smartphone users to take full advantage of the multicamera capabilities in flagship models. 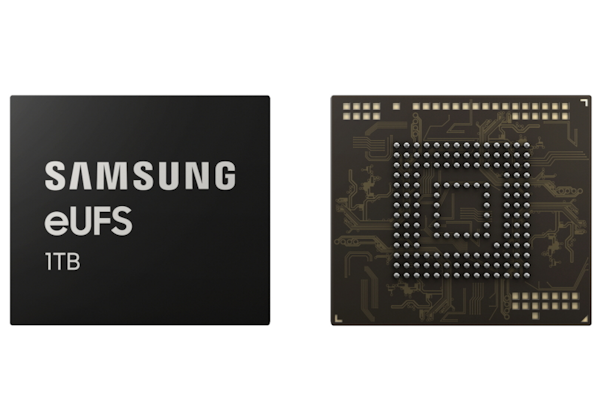 Samsung introduced 512GB internal memory for its phones released in 2018, but began mass-producing the 512GB module in November 2017 ahead of the launches. At least one model in its upcoming Galaxy S10 family of smartphones, due to be revealed on 20 February 2019 in San Francisco, is likely to come with a 1 TB storage capacity option. As production for the flash storage has begun at Samsung's plant in Pyeongtaek, South Korea, we predict we could see more smartphones with terabyte capacity announced at Mobile World Congress in Barcelona at the end of February. As a result of a general market slowdown, 2018 wasn't a stellar year for sales of Samsung flagship smartphones, and this was reflected in the company's latest financial results announced yesterday (see Instant Insight: Samsung Results 4Q18). We expect Samsung to use the terabyte storage option as a selling point for its devices and as a show of technical leadership. However, a device with this much capacity could push retail prices to about $1,500. This is a dilemma that smartphone makers now face, particularly in light of slowing smartphone demand and resistance to pay the higher prices of highly specified smartphones with giant memory configurations. That said, the fast write times along with the massive capacity of Samsung's new chip will ensure that it becomes valuable supporting technology for emerging 5G smartphone uses, such as downloading large amounts of high-quality video and audio content in short order.